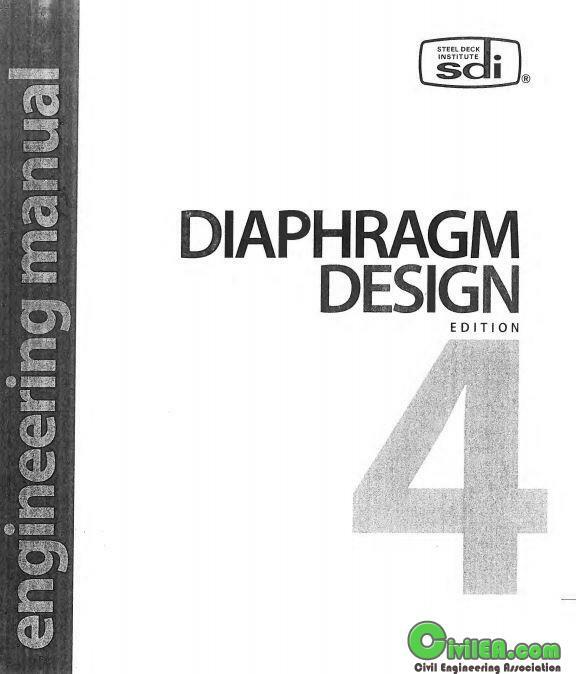 he Fourth Edition of the SDI Diaphragm Design Manual, DDM04, replaces the Third Edition, DDM03. It includes information for the design of steel deck diaphragms for roof and floor decks and complies with the requirements of the ANSI/AISI S310-2013 North American Standard for the Design of Profiled Steel Diaphragm Panels. It includes information on diaphragm strength and stiffness, fasteners and connections, and warping and stiffness properties. Also included are 25 Design Examples, many of which are being published for the first time. Load Tables for proprietary and, for the first time, generic fasteners are included. New link with revised file (annoying link at bottom of each page eliminated and Acrobat Pro. optimization run).